This was the only Watkins model to be mass produced in white polyester finish although a few early Rapiers had a similar finish. Two scratchplate types are known, the angular one shown right and the Rapier type shown in the picture above. 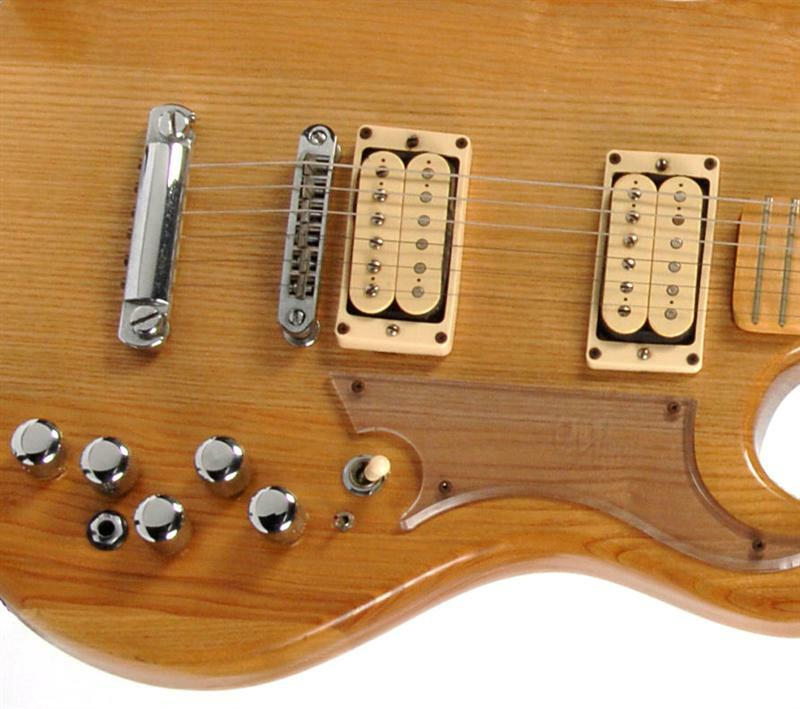 A feature of the Circuit 4 was a very complex combination of pickup and tone combinations made possible by a rotary selector switch and a set of three push buttons. One unforeseen construction fault was the push button caps eventually falling off in virtually every one produced. 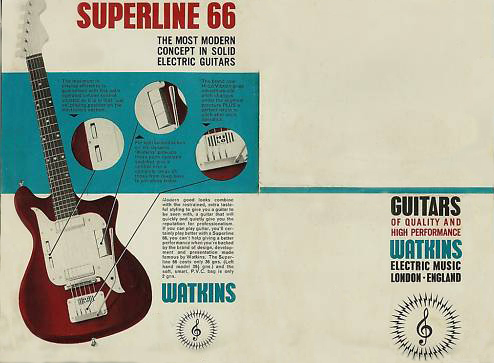 Here's a rarity from my collection- a Watkins Superline 66. Probably early 60s by the styling and serial number 107. Push button pickup selectors and edge volume controls were state of the art at the time. Pickups were Rapier type. The original finish options would probably have been dark mahogany or red. This is an incredibly small and light guitar to handle. 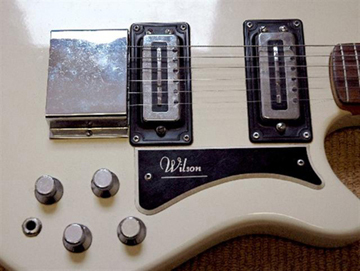 In the control cavity, switches pickups and pots were mounted on a metal chassis more reminiscent of amp technology. "VIBRA" 1957 when Reg and I started on the Guitars I had a lovely looking cast aluminium tremolo designed by a sand casting engineer. 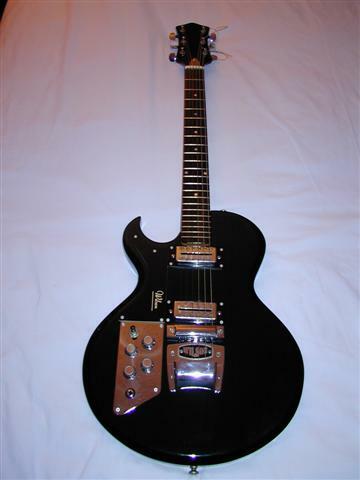 It was gorgeous, and what with the word "Vibrato" etc being bandied around at the time I decided to call my new Guitar with new Tremolo the "Vibra" model. Which I did and put it on some of the "USA National" copies Reg and I did at the time. Suddenly up comes Jim Burns and claims I'm using his trade mark name which I wasn't because it was two years hence and I had trade invoices to prove it. But him being the latest accordion "Messiah" and me being just old Charlie I decided to give him best and discontinued my "Vibra"
Jim Baldwin has sent me a picture of him playing a Watkins Rapier Series 1 (or is it a Vibra? )around 1962. 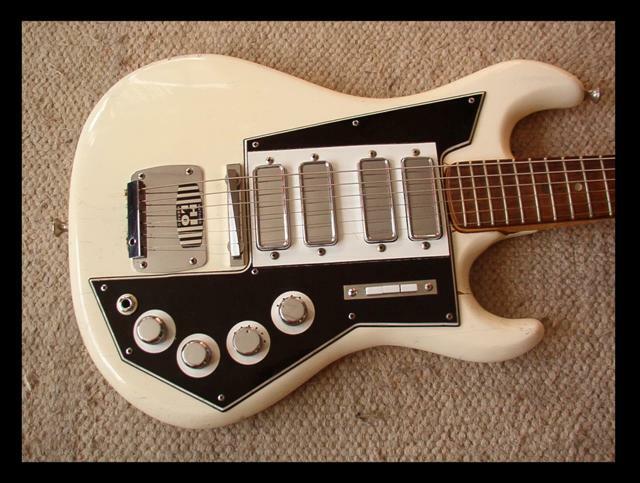 The interesting thing about Jim's guitar is that it seems to have been made at a time when the Series 1 was turning into the Strat-type Rapier so it has six-in-line tuners, tremolo arm and three pickups like the Rapier 33. 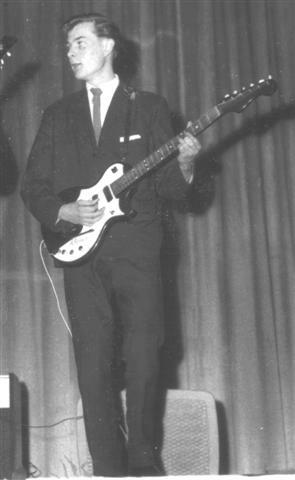 Jim is still gigging with "Mervyn and the Starbeats" but he says the hair and the suit have long since gone. Join the club, Jim. The Wem Sapphire was one of the mid 60s models but still retained the old strat style body.The scratchplate was more reminiscent of the Rapier Bass and there was a definite hint of Burns about it. The paint shop seemed to have mastered a sunburst finish to good effect. 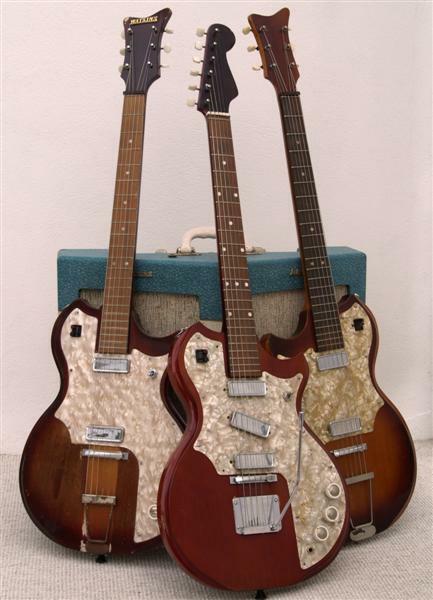 There was also a much rarer 12-string model which commands a much higher price on the second hand market than the other models. 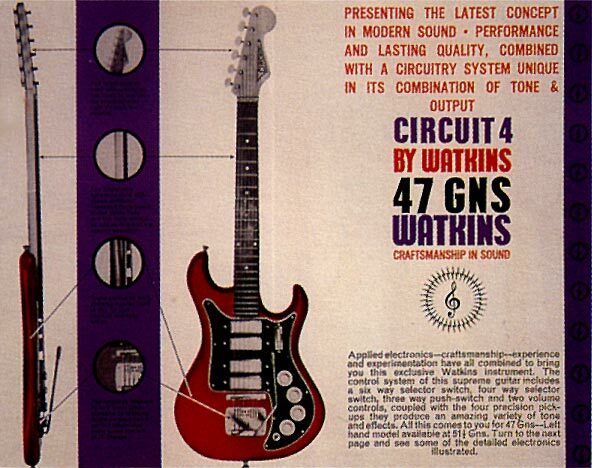 1969 price was £61 for the Sapphire 3 and £67 for the 12 string. Above - an unusual colour variation of the Sapphire owned by Colin Shore. 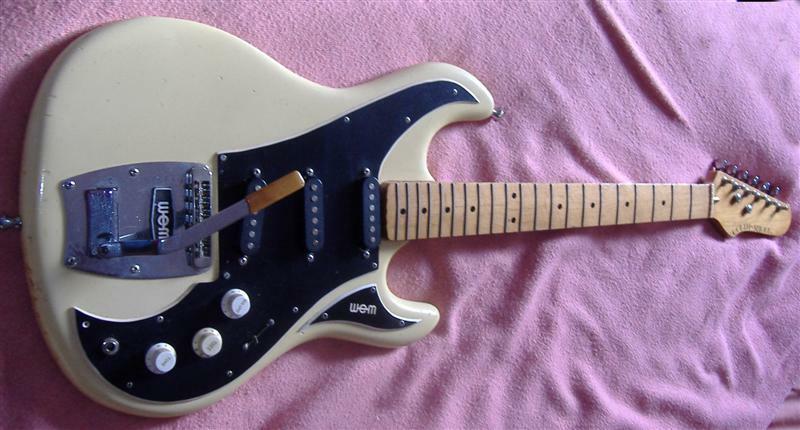 This one has a non-original scratchplate and Strat style pickups which were added later. The neck does not match the usual Sapphire style of headstock and bar fret markers and could also be a replacement. Many thanks to Doug Lean for these picture of his rare WEM Emerald 12 string. 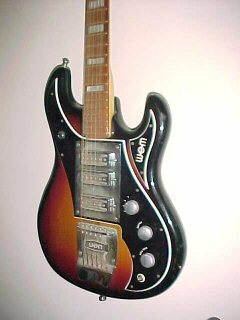 Presumably produced during the 1964-68 period of WEM branding but nothing else is known of this model or whether there were also 6 strings and basses produced under the Emerald model name. Charlie Watkins says that the name came to mind because Reg Watkins mother was always talking about her beloved Emerald Isle (Ireland). 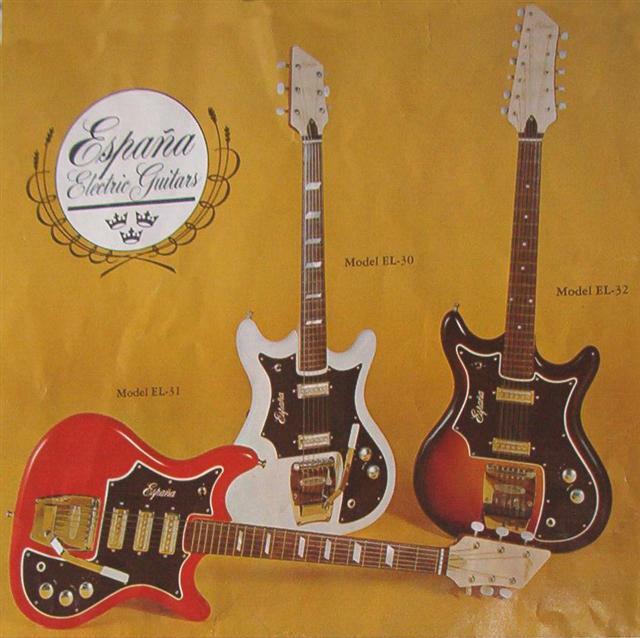 The style is almost identical to a range of guitars possibly made by WEM for export which were branded "Espana" (see below). The only clue to WEM origin was the three crown logo which was later adopted by the Wilson brand. I believe that US company Buegeleisen & Jacobson sold the Espana range. I have asked Charlie Watkins about this theory but he has no knowledge about WEM producing a rebranded range for export. 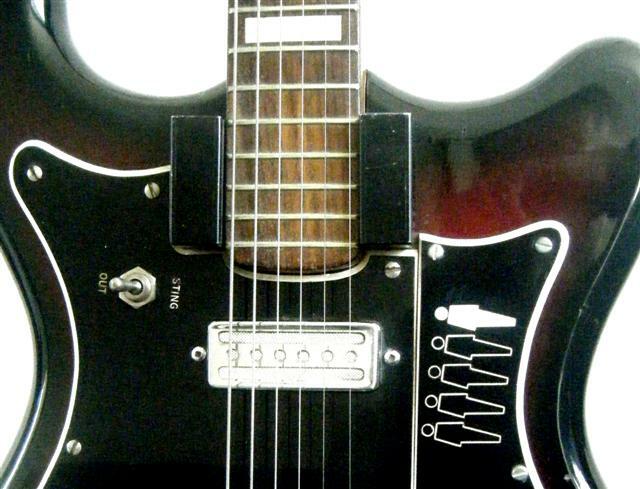 Owners of Espana electrics in the US have reported that their guitars are stamped 'made in England' on the neck plate. More investigation is needed on this subject. Alan Exley has sent me pictures of an unusual model. 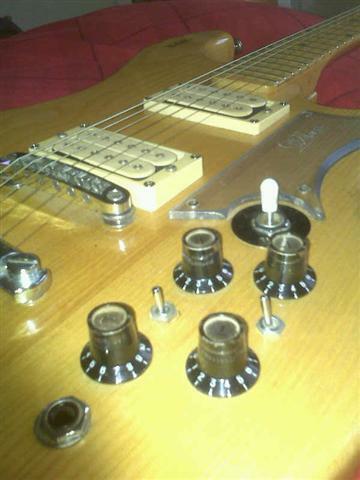 The body and pickups are Sapphire type but the scratchplate is more like the Emerald and Espana range. Neck is Rapier type. This could have been a prototype or a staff special made by one of the workers from reject parts. The trem plate and mechanism are non-original. The top guitar is a Wilson Ranger 1 #14080. The lower guitar is my Wilson Ranger 2 # 14462 made in 1968 which I have owned since 1969. This one shows how the company tried to change the traditional 'Strat shape' which they had produced for so many years. The tremolo facility has gone and the headstock has been changed to accommodate the 3-each side tuners. 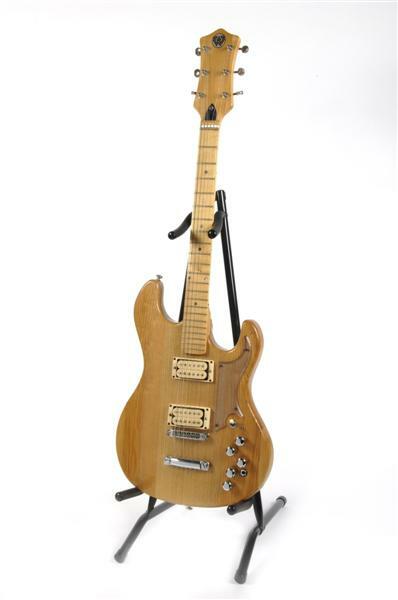 This model has a mahogony neck and a very low action which makes it a delight to play. The intonation is very good even without the facilty of adjustable saddles for the strings. Early Watkins open tuners were not of very high quality and seem to have been sourced from an acoustic guitar manufacturer. You will often find odd replacements have been fitted. See renovations page for replacement ideas. 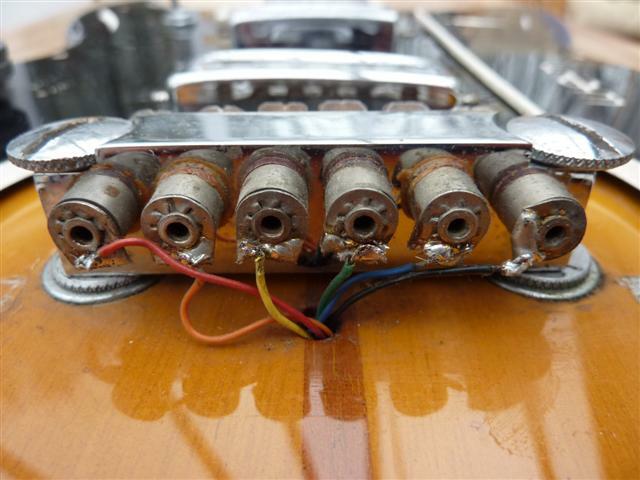 By the late 60's this weakness seems to have been identified and they were using closed Schaller tuners on most models except the Ranger. 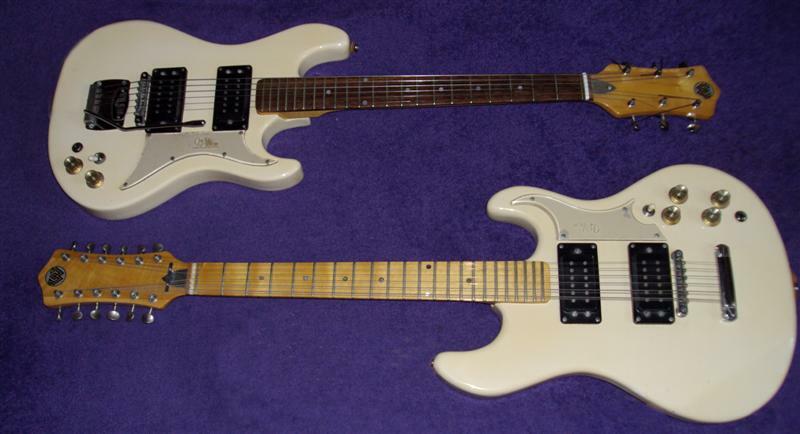 The Ranger 1 and 2 were entry level guitars designed for those youngsters unable to afford their first Rapier. Having said that, there does not seem to have been any compromise on quality and the electronic and most hardware components were interchangeable with the Rapiers. 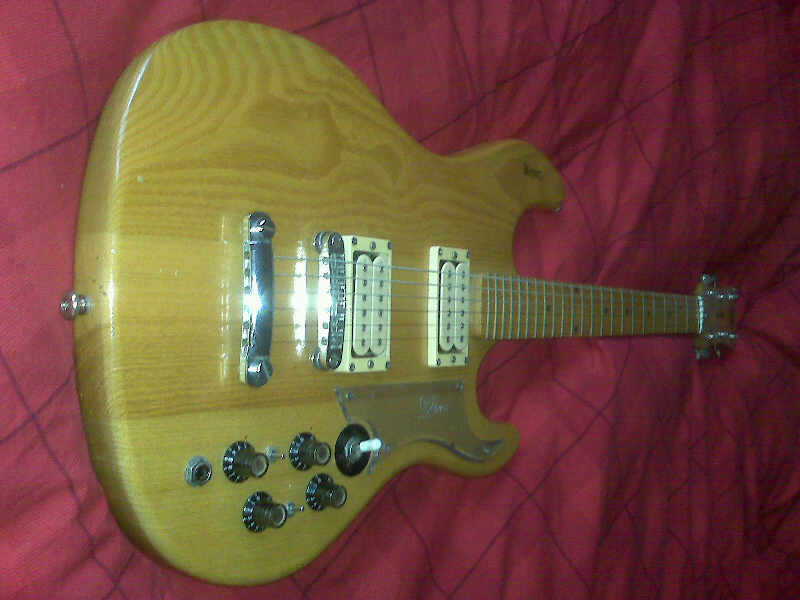 Below is a picture of a rare original sunburst finish Ranger 2 #13345 Thanks to Bob Sykes for the picture. 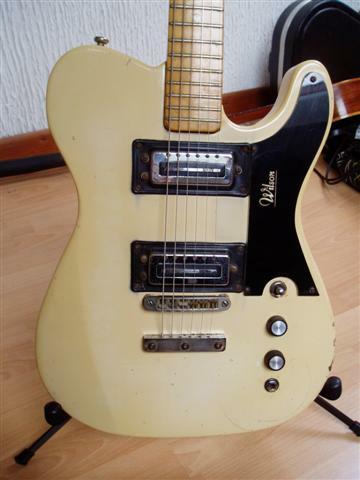 Interestingly, this one seems to have much older toaster style pickups. The Wilson factory did sometimes mix and match available parts. This was a mid 70s model produced by Wilson as they diversified away from the classic Rapier shapes. Not many were produced. These photos of #16851 were supplied by Nick Harling and the guitar was owned by Geoff Gaskell. This rare Mercury was basically a hand-built special of the Super Six and saw a return to the Rapier shape although with a much thicker and heavier body. It was marketed as being individually made by Sid Watkins. This guitar above is owned by Richard Bettis. There have been a few mods to the pickup selectors. 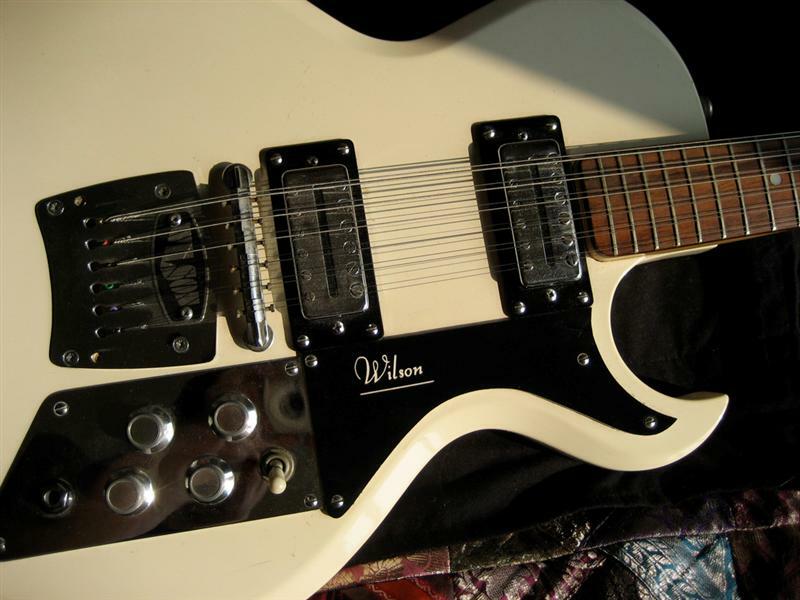 Above - a pair of specially commissioned Wilson Mercury guitars from 1976 which are still in the same ownership today. Many thanks to Paul for the picture. 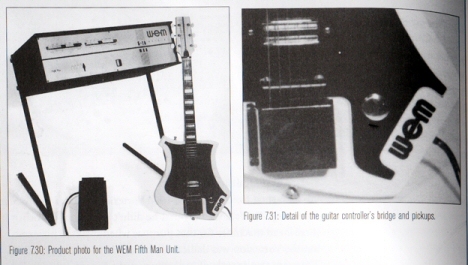 "This guitar evolved from the WEM guitar Organ (the Fifth Man)which played an organ generator from the fretboard. It was the biggest commercial disaster I ever invented. It was too big, too expensive and took too long for me to realise that a guy buys a guitar because that's the sound he wants in his ear. If he wanted organ sound he would probably buy an organ! The Project 4 fuzz sound comes from the bridge itself and not from the pickups. The drive comes from the funny magnet arrangement by the bridge designed for me by a professor at Sussex University in 1965 which was about the year we started to sell them"
The Project IV guitar is certainly full of mysteries. 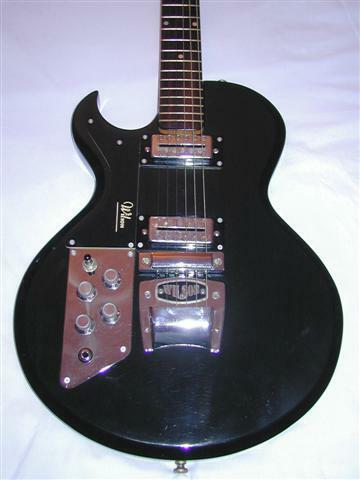 Charlie Watkins has said that the key to the guitar's operation was a magnetic arrangement in the bridge. 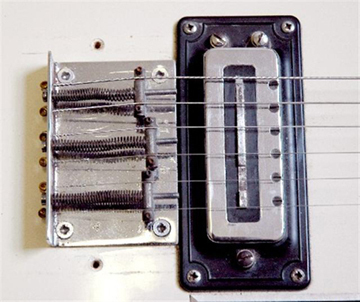 Having examined my guitar carefully, all I can see which is special about the bridge is that each string is electrically insulated from the rest and a wire is taken from each string under the scratchplate where some circuitry is applied (see photo below). It looks extremely complex under the scratchplate but this is because a three transistor effect circuit is reproduced six times on the circuit board (once for each string). There are preset pots on the circuit board which appear to be used to adjust the tone of the sound and amplitude for each string. A further mystery has arisen. Tim Hall has sent me a picture of his guitar which shows two magnets attached either side of the neck at the junction with the body. No other Project IV I have seen has these magnets and their purpose is still to be investigated. 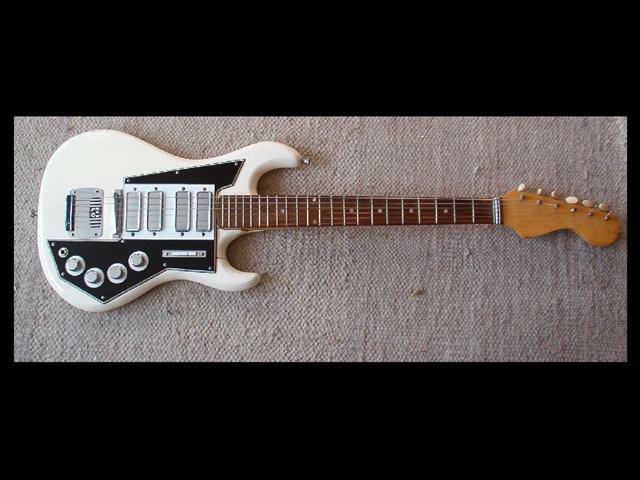 The technically brilliant but commercially disasterous Fifth Man guitar organ is shown below. 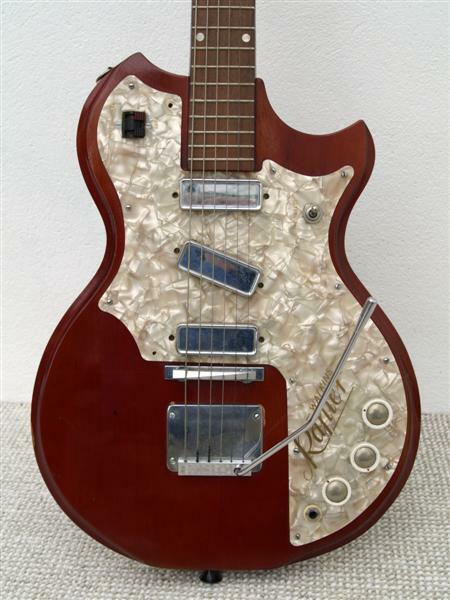 It was produced for the 1965 Frankfurt Music Exhibition but was too expensive and cumbersome. The electonics were condensed into the Project IV above hence the "Fifth Man" logo on the Project IV scratchplate. 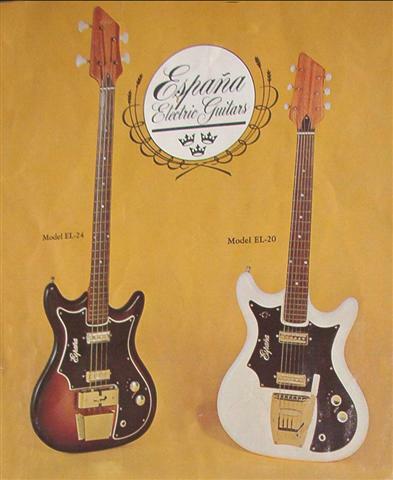 Above and below are catalogue pictures of the Espana range of guitars which I believe were produced by the Watkins factory betweeen 1964 1nd 1968 purely for export to the US. 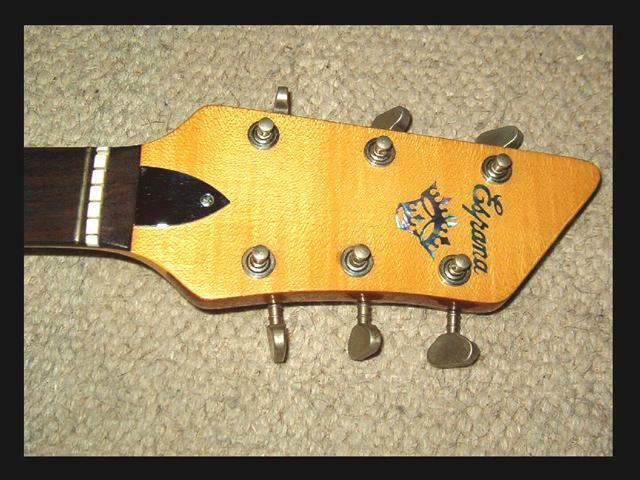 The three crown logo was later used as a headstock motif on Wilson guitars . See comments on the WEM Emerald above.